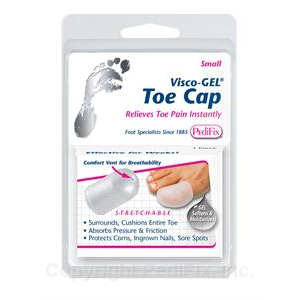 The PediFix Visco-GEL® Toe Cap is a all-Gel Toe Cap instantly absorbs pressure and friction to help prevent and ease pain from ingrown nails, corns, hammer toes, blisters and more. The PediFix Visco-GEL® Toe Cap is a all-Gel Toe Cap instantly absorbs pressure and friction to help prevent and ease pain from ingrown nails, corns, hammer toes, blisters and more. Stretches to fit any toe. Comfort vent at tip allows skin to breathe. Our exclusive Visco-GEL® surrounds the toe while it releases mineral oil and vitamin E to soothe, soften, and moisturize skin. Great for fingers too! Washable and effective for weeks.